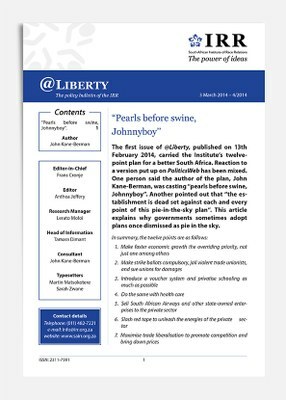 3 March 2014 - The first issue of @Liberty, published on 13th February 2014, carried the Institute’s twelve-point plan for a better South Africa. Reaction to a version put up on PoliticsWeb has been mixed. One person said the author of the plan, John Kane-Berman, was casting “pearls before swine, Johnnyboy”.